Laura Ann’s birthday is just a couple weeks after Christmas, and it’s kind of become a tradition now where I sew her something for one of her Christmas/birthday gifts. 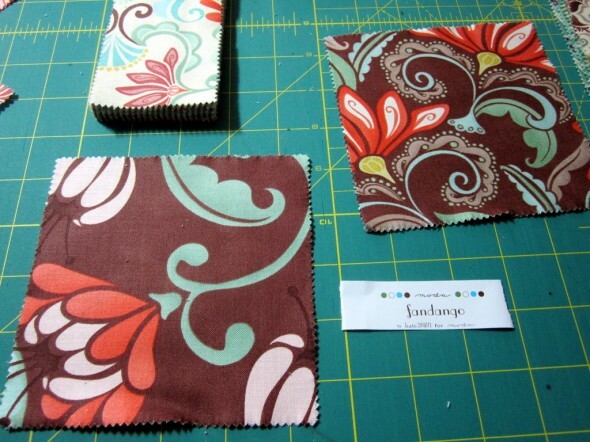 First came the travel wallet, then the quilt, and now just something small–mug rugs. I’m jumping on the bandwagon of this surprisingly addictive trend. They were so much fun to make, I may whip some up for us to use around the house. LAM came over on Friday, and it was the first time we’d seen each other since around Thanksgiving. So we just exhanged Christmas and birthday gifts, but these mug rugs had been put aside before the holidays when I was just feeling too pregnant to look at my sewing machine. 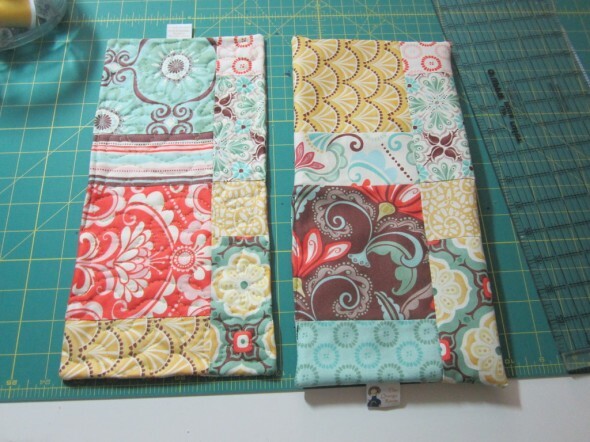 I’d finished the tops but hadn’t quilted them, so on Thursday night I finished them. It’s the first thing I’ve sewn since H’s arrival, and it took quite a bit of time to squeeze in some sewing with her wiggling and wanting hugs. But I got them done, and I love them, and LAM loves them. The homemade tradition continues! So here’s what I did, these were definitely a make-it-up-as-you-go kind of project. In my stash I had a charm pack and a candy bar of “Fandango” by Moda for Kate Spain. I don’t even think they make candy bars anymore, that’s how long these treats have been in my stash (maybe they were a special edition?). 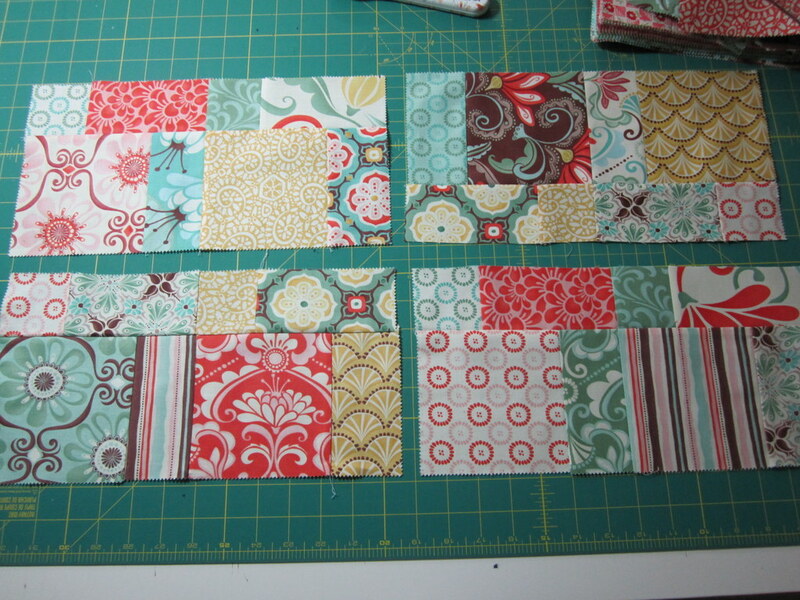 I thought the colors and bold, girly print were great for Laura Ann, so I finally cut into them for this project. 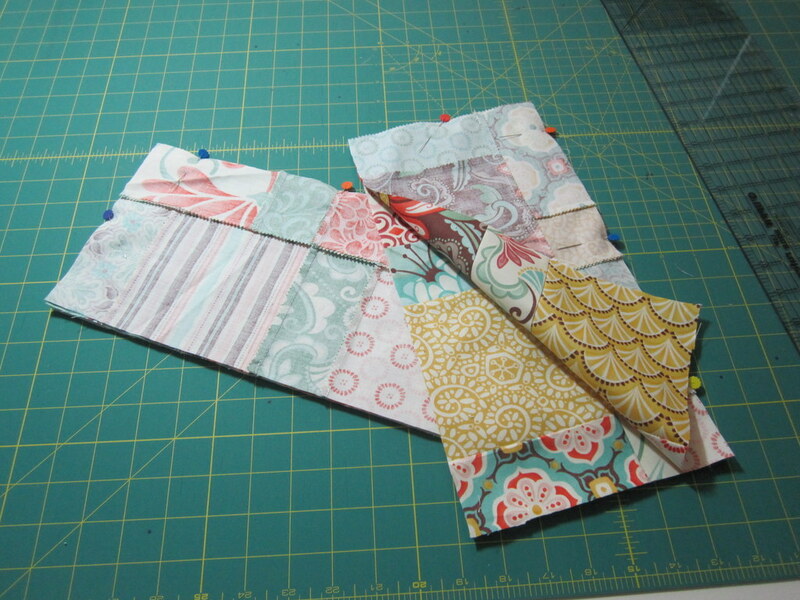 The candy bars are precut 2.5″ x 5″, which worked perfectly with the 5″ charm squares. 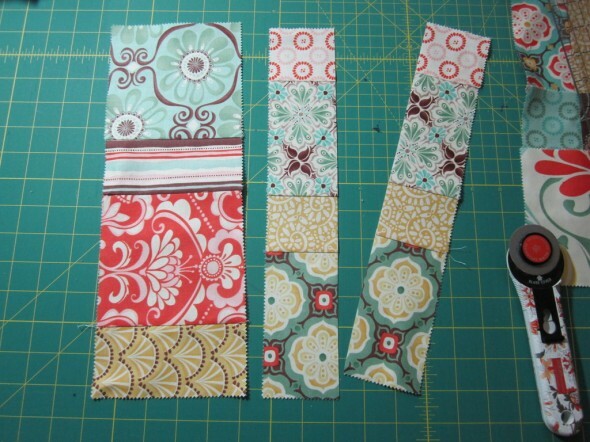 So I sewed 2 charm squares and 2 candy bar strips together (left). I made 6 of those strips. Then I cut 2 of the new strips in half (right). I arranged 1 fat strip and one halved strip together to make 4 sides. My mug rugs are reversible. Then I sewed them up when I was happy with the layouts. 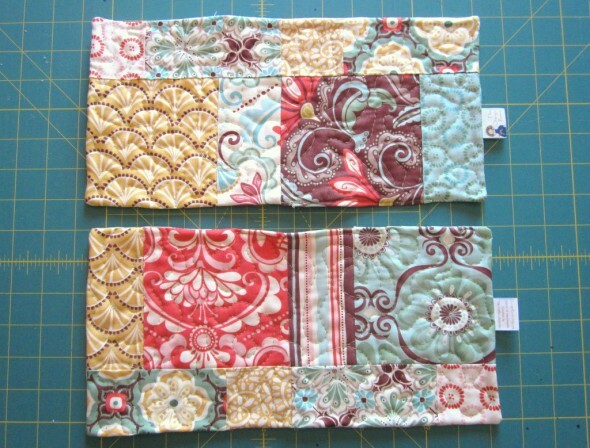 I cut some thin cotton batting to size and made the quilt sandwiches. I sewed them all the way around, leaving an opening to turn them inside out. I turned the opening inside out and sewed it closed with coordinating thread. 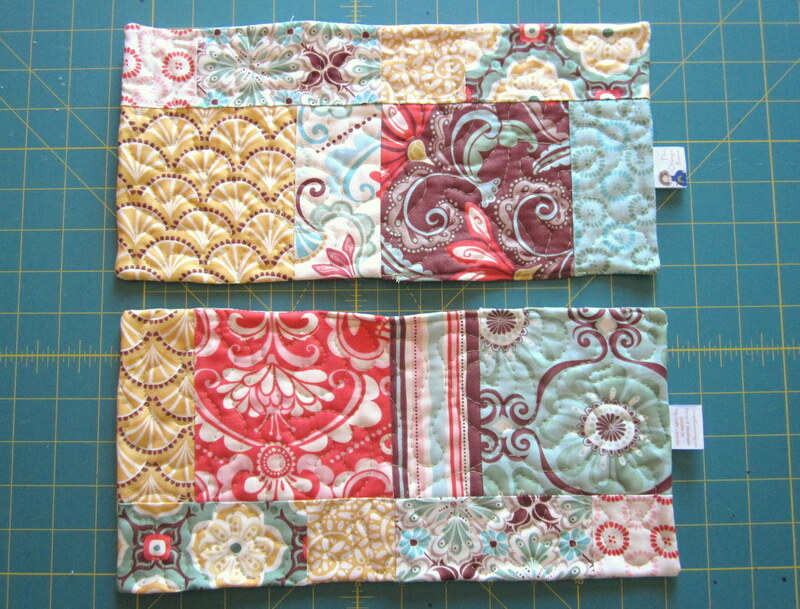 Then I quilted the entire mug rugs with a meandering quilt design (left). And voila! They’re done. Quick and painless, and really fun.